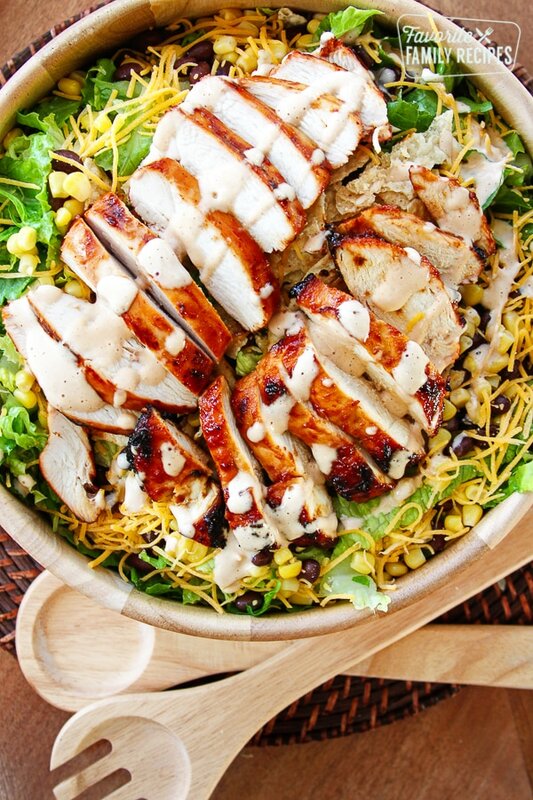 I love BBQ Chicken Salad, especially in the summertime. Grilled chicken, black beans, corn, and creamy BBQ dressing make this salad absolutely perfect! The dressing for this BBQ Chicken Salad recipe comes from my very good friend Mel over at Mel’s Kitchen Cafe (one of my very favorite bloggers). I used this dressing on my usual BBQ chicken salad and it was out of this world good! Typically I just combine ranch dressing with BBQ sauce (and you can totally do that if that is what you have on hand) but this dressing is way better! I have mentioned this several times in other blog posts, but getting the chicken just right is everything. People are always asking how I get juicy grilled chicken and the answer is easy: use a DIGITAL meat thermometer. Don’t be hacking your chicken apart every five minutes to check doneness. Digital meat thermometers are amazing little gadgets and they can make ANYONE a grill master. I honestly don’t know why anyone WOULDN’T use these. They are cheap, they are accurate, and they will give you perfect meat every. time. I can’t emphasize it enough. If you don’t have one. Get one. Also, if you want to have tender grilled chicken you need to be patient and cook over medium to medium-high heat on the grill. Don’t crank up the temperature and turn the outside of you chicken you charcoal. You will have a burnt outside and raw inside. Take your time. Do it right. Your guests will thank you. As for the BBQ sauce to put over the chicken, we find ourselves always using either Bull’s Eye brand or Sweet Baby Ray’s, but really, any BBQ sauce will be a winner as long as you grill the chicken right! Anyway, back to the BBQ Chicken Salad. I had my niece over for dinner that night and she said that it was the best homemade salad she has ever had. It is a salad that kids will actually eat and ENJOY! If you want to make a lighter dressing for this salad, use our Cilantro Verde Dressing. In a plastic bag, combine chicken and 1 c. BBQ sauce. Seal tightly and refrigerate for at least an hour. Remove chicken from bag, discard marinade, and grill chicken on BBQ grill until cooked through. Use remaining BBQ sauce to slather over chicken while grilling. When internal temperature of chicken reaches 165, remove from grill and set aside. In a large serving bowl, toss romaine with corn, black beans, and green onions. After chicken has had a chance to rest for a few minutes, slice and put on the salad. Top with shredded cheese and tortilla chips. Serve with Creamy BBQ Dressing (See below). For the dressing, combine all the ingredients together and whisk vigorously to combine. You could also run this through a blender to make it even more smooth. For more amazing salad recipes, give some of these a try! The Original Cafe Rio Sweet Pork Salad: You can find the original Cafe Rio Sweet Pork Salad right here on Favorite Family Recipes. You read that right. We were the first to come up with this famous Cafe Rio copycat recipe. Other’s have imitated but trust me, this one is the first and the best. To this day it is still one of the most popular recipes on our site. Check it out! Nuts About Berries Salad: This is one of our favorite Spring/Summer salads. The dressing is bright, fruity, and just to die for. It is one of our favorite salads at Cafe Zupas and it is SO EASY to make at home! Mandarin Spinach Salad with Candied Pecans: Another light and tasty salad that is full of flavor. The crunchy, candied pecans put it over the top! You have got to try it! Still not seeing what you want? We have over 50 awesome salad recipes and you can see ALL of them right HERE! your recipe is too good i also love 2 cooking………………….. I made this for dinner on Saturday . . . we loved it! Made this for dinner tonight and loved it! A new recipe to add to our dinner rotation. Thanks for sharing! How long does this dressing stay good in the fridge? I would go by the date of the buttermilk in the dressing. I made this for dinner tonight! Love the dressing, but I think I will back off the cilantro next time. Maybe just one T. But so yummy! Tried this salad tonight, best summer salad I have ever had…….!! What store bought salad dressing would you pair with this BBQ salad? Hmmmmmmmm that is a good question because the dressing for this is soooooo good, no store-bought would do it justice. I know Litehouse has some good dressings ( I think they have a chipotle one that is ok ) maybe try one of those if you must go for store-bought?